Welcome to the BMW Car Club of America Nittany Bimmers Chapter. 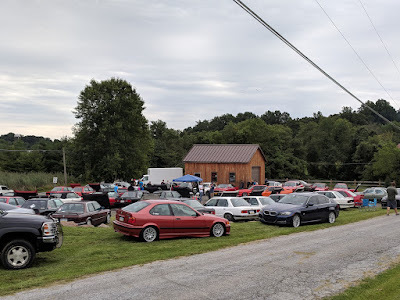 Our chapter serves BMW enthusiasts throughout the central Pennsylvania region. Our purpose as a chapter is rather simple... to promote interest in motoring; to organize and conduct touring activities; to encourage safe and skillful driving; to offer classes, disseminate information, produce various publications, and generally promote activities related to motor touring. Our vehicles of choice are made by BMW. And we have a good deal of fun along the way! The chapter is using the Eventbrite system for event management. Eventbrite makes it easy for you to register or buy tickets for any chapter event or activity. You can buy your tickets online in advance for events that have a cost associated with them by using a credit card. This will streamline the check-in process at the events because when you arrive at the event, the event organizer will simply scan your ticket to record your attendance. You can still see who will be coming by viewing the event announcement. The names of people who have already registered will appear at the bottom of the announcement following the details for the event. When you use Eventbrite to register for an event for the first time, your email address will be retained and an account established to facilitate registration for future events. You can control what Eventbrite sends to you by specifying your email preferences for your Eventbrite account. Eventbrite will not sell your information to any third parties so you will not be subjecting yourself to spam by using this system. We think you will find this event registration system to be easy and convenient to use before and during our events. View our chapter profile page to see events that are open for registration. All planned events will still show up on our Google calendar. Give it a try. Southeast Sharkfest 2019 has been confirmed for the weekend of April 27th in Spartanburg, SC. The event will begin the evening of Thursday, April 25th and conclude on the morning of Sunday, April 28th. Celebrate all that is "Big Coupe" during the 17th anniversary of Southeast Sharkfest in Spartanburg, South Carolina. This year we celebrate the 30th anniversary of the 8-series chassis and the Saturday concours will include a "E31 30th Anniversary Best in Show" award. The primary display area will be available for all e24’s, e31’s and e9’s; however – as has always been our philosophy – all registered BMW’s that do not fall into the primary categories will still be included and displayed (and eligible for the peoples choice and crusty award). The Friday group drive will take us to the Michelin test track in Laurens, SC where (for an additional fee) we will have access to their two-mile road course, generally used for vehicle testing. Should our attendance be high enough, we will also be renting the "wet" course, where we will have the opportunity to have some fun with some less than ideal traction. 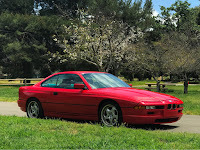 I recently bought a car that I’ve wanted for quite some time – a 1994 850CSi, in Hellrot (bright) red, with a two-tone dark silver-gray and light silver-gray interior. I bid for and won it in a Bring-a-Trailer auction, although I was familiar with the car from years past. It had originally belonged to a friend of mine from Maryland. He sold it to someone in California, and I bought it from a second California owner. My brother and I flew out to Los Angeles and drove it back home, all 2800 miles, with (almost) nary a hitch. However, the Euro versions didn’t get the fancy door handles or the wood trim. There were 1510 850CSi’s produced worldwide, of which only 225 were sold in North America (Canada got two, and Mexico one), making the 850CSi one of the most exclusive models produced by BMW. Fifty of the Euro version were sent to Alpina and became Alpina B12 5.7 coupes. 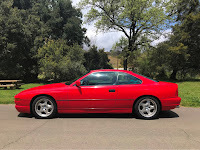 Originally, I planned to pick it up Sunday morning and attend a local gathering of other 8 series owners, but American Airlines conspired against me, cancelling my flight at the last minute. I wound up having to leave a day later than planned from a different city. It took quite some effort to get to California in time to pick up the car and not lose all the non-refundable hotel reservations I had made for the trip home. After a $75 Uber ride from Baltimore to Washington DC, and very brief overnight stay in a Holiday Inn, we got up at 3:45 am to catch a 6:10 am flight to Los Angeles. I arrived in LA after travelling for about 12 hours. The seller, who is a film and music video producer, had arranged to film me picking up the car. I'm not the most photogenic guy to begin with, and I probably looked a little like a drowned rat after the long trip, but it was a bright sunny day in LA, and the car looked great. After formalizing and memorializing the transfer, my brother and I grabbed a quick dinner and then headed off to Flagstaff AZ for the night. By the time we stopped, we'd been travelling for about 23 hours. The trip through the Mojave Desert was HOT. The car’s exterior temperature gauge read 105 degrees at 9:00 pm, and when you touched the window glass, it was actually hot to the touch. However, the car ran fine, and the A/C kept the inside nice and cold. The next morning, I got up early and swapped the stock radio for one I'd brought with me. The Blaupunkt CD43 from used in the Euro version 8 series allows you to attach a Bluetooth module that plays streaming music from a phone app, as well as allows hands free calls. Forty hours of driving demands some good music. I blasting my brother out of bed – he's not an early riser – and we headed off for Oklahoma City. Along the way, we stopped in Winslow AZ and stood on the corner. What a hoot! The local chamber of commerce has purchased a flatbed Ford that they keep parked at the corner, and the gift shops on each corner play non-stop Eagles music. We stopped for dinner in Amarillo TX at a tourist place called The Big Texan. They advertise a free 72 oz steak, provided you eat it (and all the fixings) in 60 minutes or less. We didn't try, but the normal sized steaks were good, and the place was kitschy beyond description -- deer, antelope and bear heads covered the walls, the waitstaff were all dressed like cowgirls, and there was an actual shooting gallery inside the restaurant across from the bar. After dinner, we took off driving again, arriving in Oklahoma City at about three in the morning. The third day's drive to Indianapolis was only exciting for the fact that the windshield wipers died, and it rained. Not for long, but it was a torrential downpour. The problem turned out to be just a blown fuse, although I didn't work that out until I got home. The next day, still concerned about the wipers and the weather, we stopped and got some Rain-X for the windshield, which helped with the rain that plagued us through much of Ohio and western Pennsylvania. Around 2800 miles later we were home. I never pushed it much past 80 mph (okay, maybe 100 just once or twice) out of concern for something going wrong far from home, but the car purred along like a kitten, and the radar detector helped keep me out of trouble. So now the car and I am home, and it has passed state inspection and been registered and titled in PA. My preferred BMW mechanic, to whom I've been trusting all my cars for a number of years, says he really likes it, so I take that as a stamp of approval -- not that I need any validation, beyond the ear to ear grin I can't seem to get off my face. Click Here to Register or Purchase Tickets. 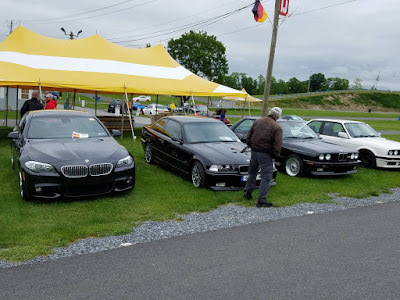 June 8, 2019 8:00 a.m. to 1:00 p.m.
You may remember the $6 Million Man, but have you ever seen a $6M BMW? Access original Street Survival photos from any device here or view the album on Facebook.